Battling dizziness and any other aches my body can ever muster, I decided to meet with Olive at Newport Mall Resorts World in Pasay City. I arrived way ahead of time because she still has a few stuff to finish at DFA for her passport renewal so I decided to scope the shopping scene. Of course, I went to the high end side (best of window shopping). I was floored looking at the diamond rings displayed at My Diamonds. I saw a very pretty princess cut diamond mounted on what looks to me as white gold priced at more than a million (I told myself "Only in your dreams Kessa!"). But hey, a girl can dream yeah? I pranced by Bvlgari and I saw a pretty handbag which again costs more than my salary for a month and that is not something I would buy myself. I've enough classic pieces already and I'd stop right there (I'l continue when I win the lottery). I moved up to the second level of the mall when I noticed that all that's around me seemed to engulf me in lust already. You can't blame a wandering eye of a girl inside a mall yeah. Anyway, I saw a line of people and voila one of the MMA fighters I was crushing on was there signing autographs. 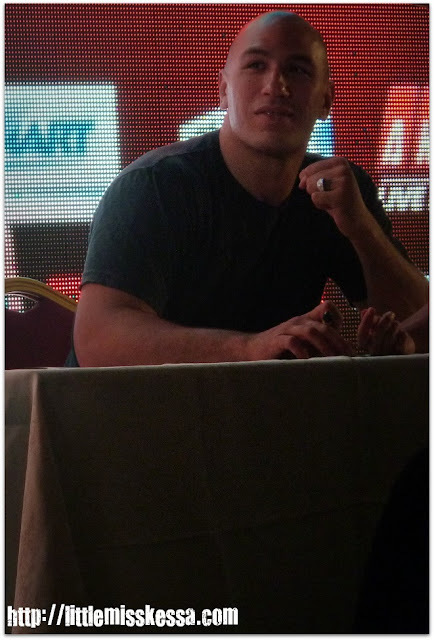 Brandon Vera flew in to help promote the Pacific X-treme Combat (PXC). The series of fights bring the mixed martial arts champions of the Pacific region for the first time in the Philippines for an all out battle for the title in the grand theater of Resorts World and yes Brandon Vera was the special guest. Silly old me, I didn't muster courage to go up and play "big fan" again. It could have been a different story if it was GSP though. While I was busy taking pictures of Brandon from afar, Olive arrived and we agreed to buy our movie tickets first for The Hangover 2 and then have dinner. We decided to have dinner at Krazy Garlik. Krazy Garlik brings together the best garlic-infused recipes from around the world. I had Indian Seafood (because there's curry in it or maybe it was Thai because there's coconut milk too) and Olive had Korean Beef. We didn't order much because we were not that hungry. The food was good and the service was too. The waiter and the manager were nice enough to come by our table to apologize because our order took some time to be cooked (they said the chef is still doing some magic to make the food more delicious). I chuckled with the excuse and I must say it was brilliant. I will post pictures on a separate blog post. We then decided to shop around and the golf store reminded me of JDS who I haven't talked to in about a week already. I guess he is busy with his family and friends while on vacation in Michigan. You could kind of tell that he was in my mind all the time we were going around. I don't know if Olive noticed. We also watched a show at Bar 360. The performers were from Russia, Belarus and the trio were Filipinos. It was a good show. Oh and by the way, we each got our own membership cards to Resorts World. I have been a member for the longest time but I haven't got a chance to claim my card because I applied and got approved online. If you want to be a member, the membership process is quick and you get your card in an instant. Of course, you get perks with the card. Oh and by the way, we walked around the casino as well and it was flattering that the guards didn't want me to get in at first without showing an ID because they thought I'm a high school student. LOL! After a little shopping, we headed to the 4th level to watch a movie. We had so much fun watching The Hangover 2. The movie was predictable but still funny. It's one of those movies that I would watch again. Anyway, I noticed as well that the brand of the cigarette that was given to the monkey was J&K. LOL! We headed home after the movie with smiles on our faces and an agreement that we will go out again the next day and go to the Estee Lauder event and watch a few French films at the French Film Festival. I Have Never Been To...Coron! Do You Know Kathy Beth Terry?